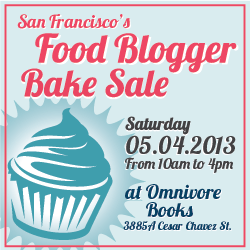 It's food blogger bake sale time again! Once a year local groups of food bloggers band together to support Share Our Strength, an organization that works to feed hungry children here in the U.S.
For the San Francisco Bay area bloggers it is this coming Saturday at Omnivore Books at 3885A Cesar Chavez St. from 10 a.m. to 4 p.m.
For more information, check out the event's website. There will be cakes, cookies, cupcakes and other treats, all baked by food bloggers and others who are not only into raising money for a good cause but displaying their amazing baking (and packaging) skills. There will truly be some amazing goodies. Worry not, those with food sensitivies or preferences, many of the treats will be gluten-free or vegan. Blog Appetit (that's me) is planning vegan chai cupcakes with vanilla latte frosting and candied fennel sprinkles, but since the recipe is still under development, watch this blog for updates. If you are a blogger or just a baker who would like to participate, it's not too late, sign up here. If you can't contribute baked goods or can't stop by to buy, we have a website for you, too. Live outside the Bay area and want to find (or start) a bake sale near you? Here's a list of other locations. Want to start your own? Click here for the how tos. Here's photos and information from bake sales past to give you a taste for what's to come!